Shares of Citigroup Inc., once the most powerful U.S. bank, briefly fell below $1 a share Thursday. The stock fell to 97 cents in late morning trading, down 16 cents or 14.2 percent from Wednesday. It was back over a dollar, if only barely, in the afternoon. New York-based Citi has lost more than 85 percent of its value so far this year, and is down more than 95 percent from a year ago as the bank was pummeled by the financial market crisis. The major market indicators extended their slide to levels not seen in more than a decade Thursday, as investors contended with more disheartening economic data, fresh concerns about the stability of General Motors Corp., and ongoing uncertainty about the financial system. The market is also extremely anxious ahead of Friday's February jobs report that is likely to show the loss of hundreds of thousands of jobs. Even some positive news, including some better-than-expected retail sales and factory orders, was not enough to stoke investor confidence. These reports failed to show a significant improvement and so the market gave back its big gain from Wednesday, said Doreen Mogavero, president of brokerage Mogavero, Lee & Co.
"The economic data is still obviously a huge worry," she said. "I don't think anyone thinks we're in the clear because the market was up yesterday." Stocks fell initially after China deflated investors' hope that it would take new steps to stimulate its economy, but the discouraging economic data sent stocks even lower. The hope that China would unveil more government spending to help its economy was a major factor behind the market's bounce Wednesday, which sent the Dow Jones industrials up nearly 150 points. The rally followed a five-day pummeling that left the market at its lowest levels since 1997. 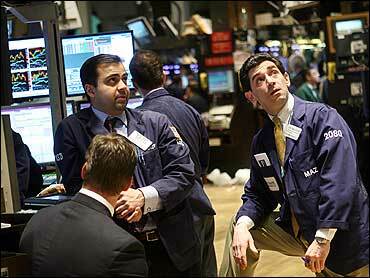 In afternoon trading, the Dow fell 268.02, or 3.90 percent, to 6,607.82, a low not seen since April 1997. The Standard & Poor's 500 index dropped 26.78, or 3.76 percent, to 686.09. The S&P has not traded below this level since October 1996. The Nasdaq composite index fell 47.15, or 3.48 percent, to 1,306.59. Even if it closes below $1, Citigroup's shares will remain on the New York Stock Exchange. Last week, the NYSE relaxed its listing rules to allow stocks that fall under a dollar to still be listed and traded on the exchange. The exchange said the change was warranted given the "current period of unusual market volatility and decline." Ordinarily, an NYSE-listed company's shares cannot remain below $1 for more than 30 consecutive days. If that happens, the company gets about six months to prove to the NYSE it can boost its stock price. Citigroup used to be not only the largest bank by assets, but also by market capitalization, which has now been decimated by the stock's decline. At the start of 2007, its market cap was riding high at around $270 billion. But by March 2008, it had fallen below the $100 billion mark. Now, it's at $6.2 billion. As the recession deepens, the problems facing Citigroup - souring loans and the impact of the recession - are only getting worse. On Friday, the government agreed to exchange up to $25 billion in emergency bailout money given to Citigroup for as much as a 36 percent equity stake in the company. The government, along with other private investors, will convert some of their $45 billion in preferred stock into common shares. If the maximum amount of preferred stock is converted, current common stockholders will see their ownership stake fall to about 26 percent. The deal between the Treasury Department and the bank is the third rescue effort in the past six months. The problem is the market knows Citigroup received no new capital last week. The conversion to common stock will create a wider equity base aimed at keeping investors calm as the economy deteriorates - but Citigroup still has $45 billion in Troubled Asset Relief Program funding, the same amount as it did before. The switch to common stock will help boost Citigroup's "tangible common equity," Wall Street's and Washington's new favored gauge of banks' health. Citigroup, criticized for years for being too multi-tentacled, has already sold off several businesses over the past several months. It has also split into two parts: Citicorp and Citi Holdings - effectively undoing the merger that created the company in 1998. Citicorp holds the company's "core" businesses like retail banking, investment banking, credit cards and transaction services, while Citi Holdings runs the company's riskier assets, the consumer finance franchises and asset management. Citigroup, which hasn't turned a profit since the fall of 2007, will face its next test in April when it reports first-quarter earnings.